Vanilla bland has to be one of the most meaningless phrases I’ve ever heard. And should I hear it again, I will let my fury run wild. For many years, I endured a certain person I saw almost every day speak of the apparent commonness of vanilla – plain Jane, no thrills, no fancies. In all honesty, there was no venom, no poison in his comments but each mention left me perplexed as he would say ‘Vanilla bland’, then go on to mention how its blandness though was not a bad thing, but merely, the ‘standard’, the average, normal…..state of being. In the plan? 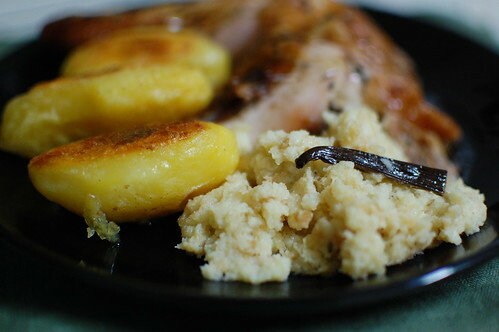 ‘Redefining’ vanilla bland; a fly by to the Reunion islands (with Bourbon vanilla pods) and a fine chicken recipe. Game anyone? Why, oh why have I all of a sudden become a raving loony, talking vanilla? First of all, if you made plain cream cakes without vanilla essence and your new world (aka Nigeria) proclaims them mighty fine, yet you…the baker, sense something seriously lacking….and traceable to the very absence of ‘bog-standard’ flavoring…..that could send you on a spiral path. Like it did me. And so, if you, desperately seeking vanilla start your search for stray pods, at way past your bedtime, say 11pm, tired, hungry and ready to drop. If you, while on this hunt, send your jar of Turmeric flying…..your glass jar of yellow spice, with innate staining ability……you would understand where exactly I’m coming from. But this is me – I’m my midnight crew, working alone in the long (not lonely), dark hours of the night. ‘Vanilla has a PR problem. As a noun, vanilla refers to our most fragrant and complex flavor, the one we use to improve everything from cheesecake to chocolate. But as an adjective, it is a pejorative, employed to describe anything common, generic, or bland. We say “plain vanilla music” to indicate the mind-numbing elevator variety ……. It wasn’t always this way. 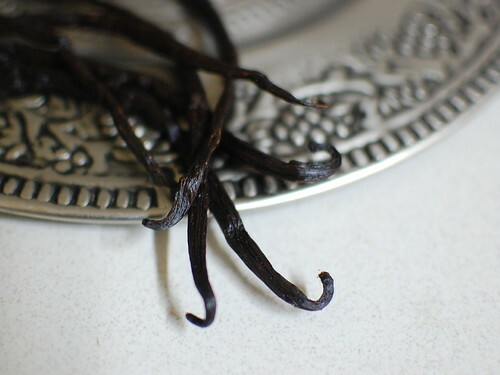 For centuries, vanilla was considered exotic, luxurious, and rare. See, my kitchen disasters are numerous but I have never been bullish and outspoken about them. This time though, I can hardly keep quiet. And I appeal to you, in all your niceness and warmth to listen. Kitchen disasters cannot be limited to singed eyebrows, pink palms, dropped turkeys and any of the other ‘common’ happenings that give each cook a tale of their own. No sir, Turmeric dropping is in a class of its own. The first sign of this is the sound of shattered glass. My head is stuck in a cupboard some feet above while all around me, broken glass plays confetti magic with the tiled floor. Shattered glass on stone. All I say…..silently too is ‘Oh no’. This is so not the time to clean up….anything. For a few minutes, I have no way of knowing what spice lies sprawled on the floor, jar broken. Ever so gently, I turn my head southwards and when I see yellow, metallic powder spread like sand…on a beach, my heart almost fails me. Why? Because I know Turmeric. She leaves her mark in colour. A yellowish tinge which permeates everything, stone included. I need no bidding to avoid this. Sponge. dishcloth. Soap. Bucket. Bowl. I carefully pick out the glass shards and send it all into the trash. My white Philips toaster has been touched. It belongs to me, I’m fine with it taking on a close-to-sunny hue. Unlike my landlady would be…..if she came round (not that she does) and saw four of her countertop tiles slightly colored. I begin my scrub. It is going to be a long night. We didn’t have to pay a deposit on our rented house so there’s no fear of losing that bit but we would like to keep the rent at an affordable level now, wouldn’t we? So I get washing, scrubbing, cleaning….multiple times till I’m sure I can only see a sheen, some slight fluorescence that remains. Actually, Im no longer sure if its my eyes, heavy for sleep that starts seeing ‘yellow’. In the end, I throw my sponge down and head to bed. Satisfied that I’ve found my vanilla pods, but sad that my turmeric is no more. Satisfied that vanilla is back in the running, I decide to venture out. Having mostly used it in sweet recipes, I turn to my gorgeous book ‘Chicken & Egg’, a great find of recipes and pictures glorifying chicks and chooks from around the worldl. 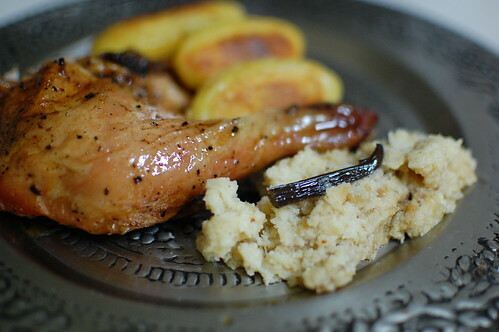 The recipe on page 19 features Bourbon vanilla pods (tick) and a whole chicken (tick). There’s also fromage blanc (no ticks on this but I have an alternative in mind) and your regular salt and pepper. This time when I reach for the vanilla pods, high up…I do it with utmost care. I watch for glass jars that are eager to get broken, spice boxes that want to lose their contents and other wayward belongings in my stuffed-to-the-brim cupboards. I gingerly bring the kilner jar full of rich, fragrant pods, down. It is night time when I wash and dry my bird, season it with salt and pepper and smear rich and sticky vanilla seeds all over it. I lay it to rest. And then I begin making my fromage blanc alternative. I take some whipping cream which is thick. I season it with kosher salt, sprinkle lemon juice over the top and stir in chopped vanilla pods. This too is laid to rest. …and this went into the cavity of the bird, which was then sealed shut with some fine needles. 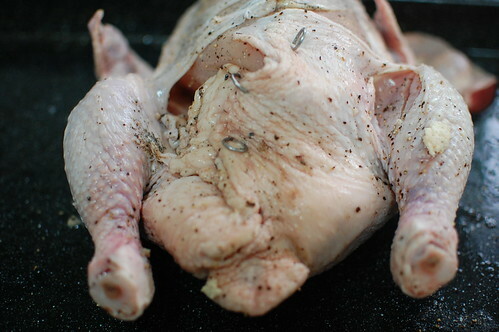 An hour and a half later, numerous bastings too….we ended up with a fine bird that I was ready to tear into. The bird was bronzed and flush with warm fragrance. Tender too. I tore bits off the bone as the children lined up, ready to devour some with roast potatoes. And I snuck a bite. It was ok, nice. Interesting even but it lacked the strength of vanilla flavor that I expected, longed for – both out of desperation to experience vanilla in a new way but also in defense of it, to prove the vanilla-bland naysayers wrong. The chicken wasn’t likely to do either for me. What emerged though was the absolute stunningness of the stuffing! Unbelievable. In my husband’s words ‘the stuffing is great’. Simple words, I know but if you knew him like I did….you would consider this high praise. The stuffing is perfectly balanced – creamy, soft and best of all, fragrant with the warmth and romance of vanilla. Yet the slight tartness of the ‘cream’ is complemented by the flavor of the chicken. the bread crumbs hold it all together, providing a spreadable stuffing that would be wonderful on bread. Yes, bread on bread….but I’m thinking chicken sarnie, with some crisp green lettuce, frilly at the edge, yes. Then stuffing, followed by torn strips of chicken and freshly made celery salt, all capped with a fine slice of crusty french bread. What do you think? For this singular fact of a sandwich, I think it might be worth making this again. BTW, the kids LOVED it…. And me, I’ve recovered from my turmeric disaster, and my tiles have reverted back to normal. 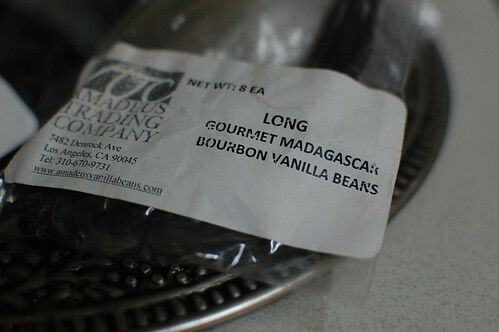 ..But vanilla is essentially a supporting actor. It is a sociable flavor, at its best when bringing out the best in other distinct ingredients, softening their acidity, drawing out their intensity, helping them to cohere. This is why baked goods made without vanilla lack depth and dimension, like music without a bass line. Prepare the chicken: (the day before). 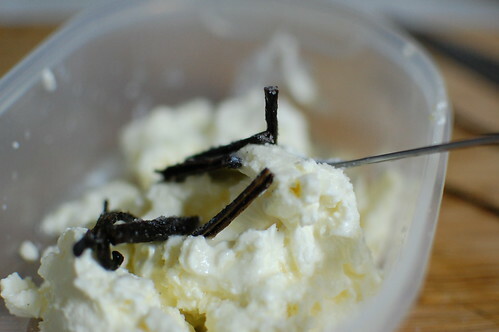 Split the vanilla pods and carefully remove the seeds, using the pointed end of a knife – reserve the pods. 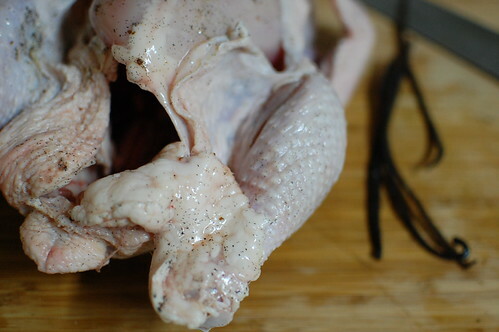 Make slits in the chicken and slide the vanilla seeds underneath the skin. Rub the skin with the pods, set pods aside and wrap the chicken in cling film. Allow rest overnight in the refrigerator. 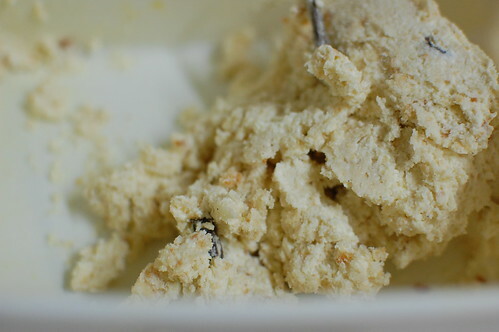 Cut the vanilla pods into four parts, saving 2 pieces to garnish. Mix the other two with the real/made-up fromage blanc. Cover and store in the refigerator overnight. Prepare the stuffing: Combine the breadcrumbs and the fromage blanc. Blend well, still leaving the vanilla pods in the mixture. Remove the clingfilm from the chicken. Season the cavity with salt, black pepper and red pepper flakes. Then stuff with the breadcrumb mixture. If you can find oven string (I couldn’t…though I did find it the very next day!!! ), truss up the bird, otherwise close the cavity, with baking pins. Place on a roasting tray and set in the middle of the preheated oven. 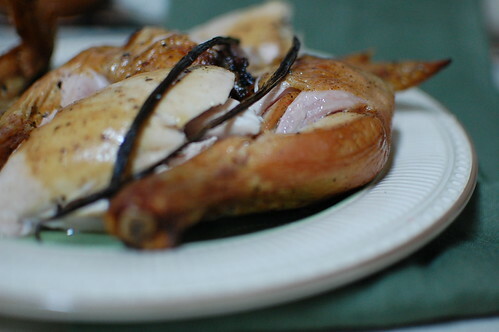 Cook for 1 1/4 – 1 1/2 hours, basting the chicken with its juices and giving it a quarter turn (just reading this, obviously I didn’t do it then!) every 15 – 20 minutes (most tedious part of the task! 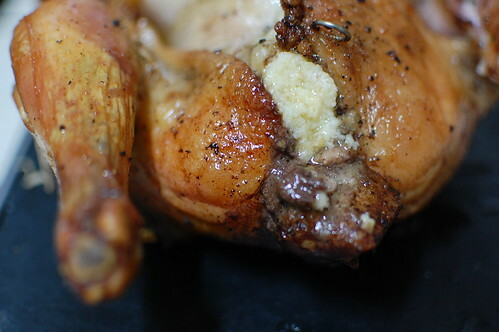 ), until the chicken is cooked and tender. When done, allow it rest for 15 – 20 minutes then carve….or tear apart, serving with dollops of the stuffing and some tatties…. All trussed up with nowhere to go? And so it is that I, I….am still in love with vanilla. Plain and simple. No fatigue, no taking for granted, no abuse. Just plain ole-fashioned love. I want all my cakes and bakes and even roasts to be infused with warmth and depth and romance. And vanilla is just the thing to do that for me! I will try again. Who knows what a vanilla pork roast would taste like? I can’t give up now! Are you a cook who has delicious savoury vanilla recipes? Share them please!